I can’t make my mind up about this piece. At first I thought the photographer had lost his senses, that he had entered into the realm of esoterica and left that sense of having his feet firmly planted upon the ground (which is exhibited ((I believe)) in the rest of the photographic collection) and that he had taken leave of his senses. That was until I took a closer look. I don’t know whether any other Grimes fans out there have noticed, but hidden almost subliminally within this stellar photographic representation, is the suggestion of Yin Yang. I have never seen this done before – a deeply religious symbol that transcends the very fabric of industrial Britain, embedded in the photo, expressed by a skilled photographer through the ingenious positioning of his camera! Incepto ne desistam! Clearly, the artisan had all this in mind, in ovo, so to speak, before ever pressing the button on his camera. Such an effect is not likely to arise ex nihilo. Forethought is the progenitor of wonder said a close friend of mine. Forethought is certainly exhibited in this picture. I’m won over by the photographer and wish him all the best with his imperium sine fine. A masterful shot from a fast emerging talent. 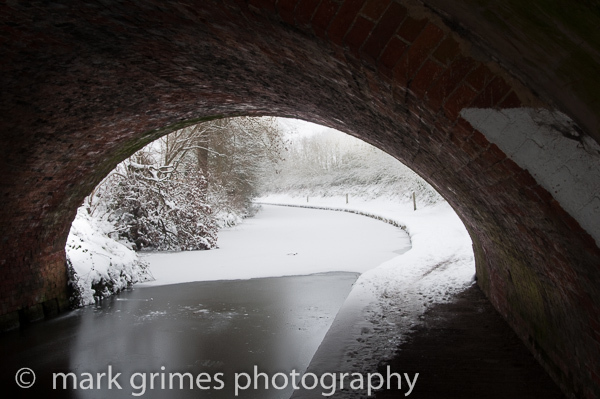 Love how the reflective quality of the snow illuminates the tunnel and how the frozen water has expanded just outside the archway. It provides a wonderfully dramatic light contrast. I am a great advocate of positive thinking and I must commend you for the inherent joy in this shot; it’s as though someone is emerging from an arduous journey full of gloom, into a purifying and brilliant light-a wonderful metaphor for overcoming adversity. I could easily see an image like this being used to illustrate the power of optimism…perhaps you could market it to those in the mentoring business? You have also presented a beautiful example, albeit aided by the snowfall, of a complimentary and seamless relationship between the man-made bridge and the canalside vegetation. The viewer’s eye is tantalised by the external beauty, but not to the detriment of the view inside the tunnel. Honours are shared equally. Finally, the historical information and picture location is a nice touch and not something you see in many collections.